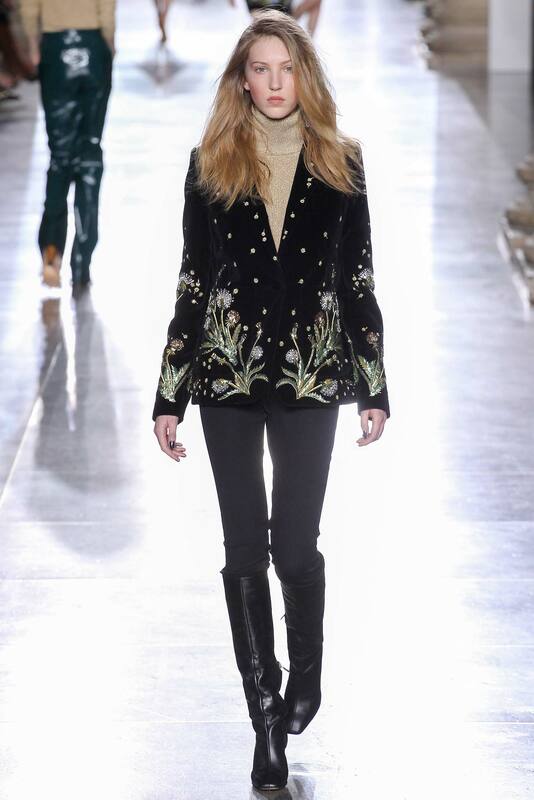 Down the catwalk of Somerset House, Topshop Unique’s Fall 2015 Ready-to-Wear featured a office driven collection. 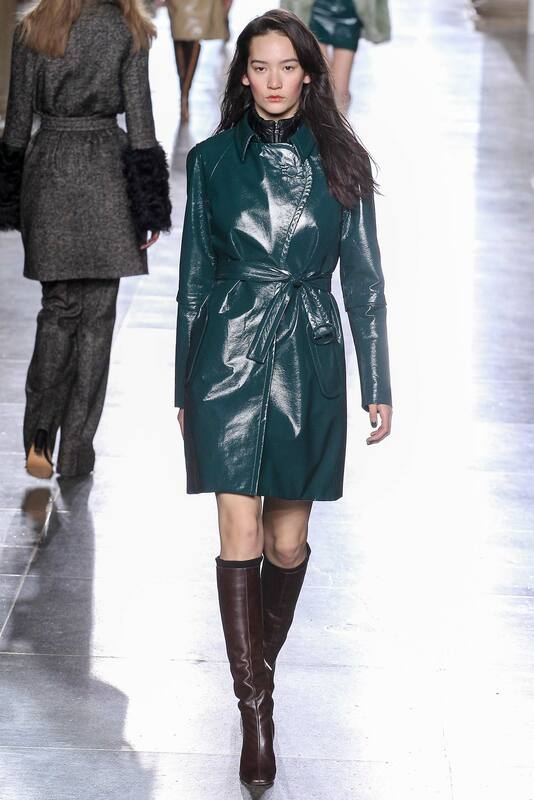 The collection brought back 70’s silhouettes with turtleneck knits layered under mini-skirt suits in suede and leather. 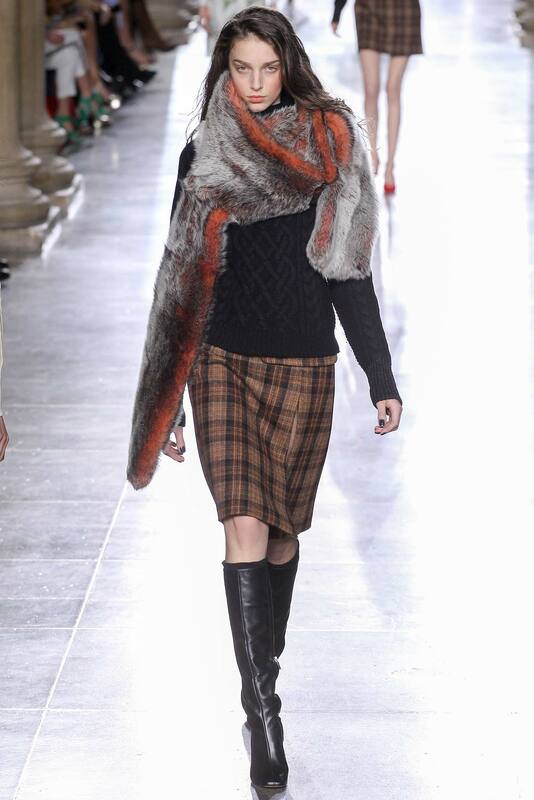 Not straying far from English roots, tweed and fur were used throughout the collection. The entire collection features a muted color palette. Starting with creams, powder blue, and terracotta, the collection is very office appropriate. Imagine a young career driven woman who might be dressing more juvenile than she should. A few feminine touches are added with delicate floral prints, fur collars, and cuffs. The collection then evolves into a confident temptress with thigh high slits in fuller knee length skirts in similar color ways. Finally, closing with dark green, blue, and black hues on mature suits reminiscent of Saint Laurent’s Le Smoking Suit in velvet. The most interesting aspect of the collection is the use of textures and intricate embroidery. What otherwise would be a very bland, British collection is broken up with unexpected pieces; such as a turquoise vinyl skirt, a feather bodice dress, or a floral embroidered velvet blazer. The evolution of the collection is strong. At first the woman is almost playing dress up in professional clothes for her first office job, layering with fur that is more suited for an older woman. Then she gains her stride with cropped coats and body accentuating dresses and owns the mature look with suits and more fur.